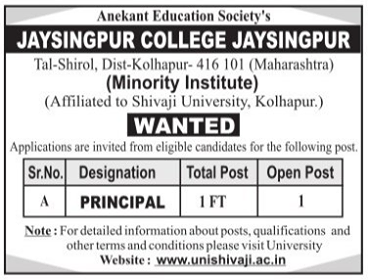 Jaysingpur College, Kolhapur has advertised in LOKSATTA for the recruitment of Principal jobs vacancies. Interested and eligible job aspirants are requested to apply by earliest. Check out further more details below. About College: Jaysingpur is a peaceful and planned township surrounded by serene and lush green fields. It is situated on the main road from Kolhapur to Sangli and is well connected with all the major cities in Maharashtra by Rail Way too. Miraj, a major junction on Southern Railway is only 10 Kms away. Narsinhawadi, Bahubali, Khidrapur, Jotiba, Panhala, Kaneri and Ramling are very much in the nearby vicinity of Jaysingpur Kolhapur worshiped as ‘Dakshin Kashi’ which is also the second cultural & historical Capital of Maharashtra is only at half an hour’s run from Jaysingpur.